The Electronic Over Ring and Push Brake is a system that provides complete acceleration control from the steering wheel. The accelerator is a ring that fits just inside and raised over the steering wheel. The ring can be depressed by the thumb or palm of the hand to activate the accelerator whilst holding the steering wheel in any position. The hand brake operates by way of a handle situated behind and to the side of the steering wheel. The Electronic Under Ring & Push Brake system transfers the accelerator control from the pedal to the steering wheel. The ring is situated behind the original steering wheel of the car, to allow a flowing, natural drive and excellent direction control. 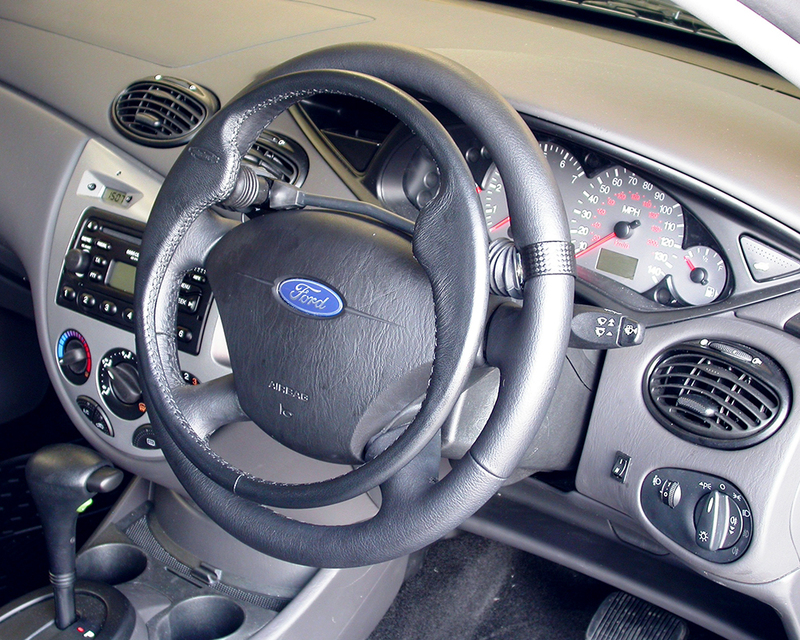 The position of the ring allows the airbag to be kept and provides easy access to the vehicle’s controls. The hand brake handle sits behind and to the side of the steering wheel. To accelerate you can either pull the ring towards the wheel or push it away. Push/Pull Hand Controls are suitable for almost any type of automatic vehicle and provide a simple and economical solution. The conventional foot controls remain in place and can be used as normal. The controls are very easy to use – push forwards to brake and pull back to accelerate. Switching for indicators, lights & horn are also available as optional extras. Floor Mounted Hand Controls enable hand controlled acceleration and braking and can be installed into most automatic vehicles to the left of the steering wheel. The controls are very easy to use – push forwards to brake and pull back to accelerate. When the vehicle is stopped the ‘hill holder’ is simply operated by pressing the button, ensuring that the car stays immobile. Foot controls remain in place and can be used as normal. 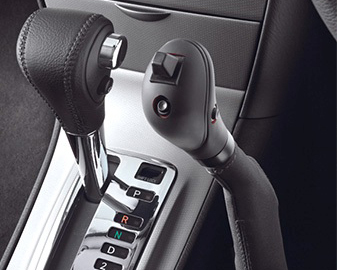 Floor mounted hand controls do not affect the adjustability of the vehicle’s steering column. The controls can also be supplied with indicators as well as other functions. Radial Hand Controls operate in a similar way to Push/pull, but instead of pulling backwards on the lever to accelerate, the lever is pushed downwards towards the floor of the vehicle.